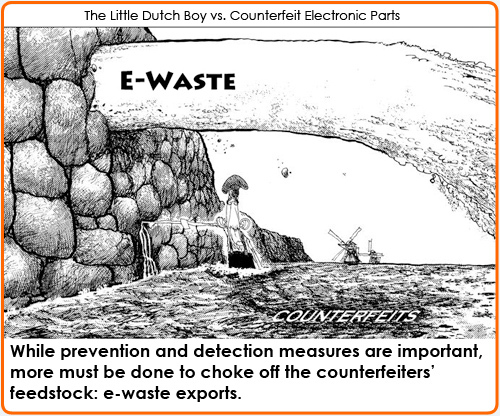 The federal government and the defense industry are enacting new policies and practices that prevent the introduction of counterfeit components into supply chains along with methods to detect them should they slip through, yet, despite several attempts, no federal e-waste recycling mandate currently exists. ERAI created this knowledge center as a resource to help educate organizations and individuals to better understand the role e-waste plays in today’s counterfeit epidemic and to make you aware of global initiatives to control the export of electronic waste (e-waste) in order to ensure that such waste does not become a source of counterfeit goods that may reenter military and civilian electronics supply chains. E-waste In the News – A live news feed intended to keep you up-to-date. Government Responses – Global initiatives committed to preventing the transfer of hazardous waste from developed to less developed countries. E-Waste Initiatives – Organizations working to pass legislation and raise awareness. Legislation – The introduction of the Secure E-Waste Export and Recycling Act (SEERA). Videos – A library of educational documentaries that capture the perils of improper recycling.